We already know that the Yankees lineup is great and is going to score plenty of runs this season. Over the course of the 162 game schedule, how the lineup is deployed won’t make a significantly affect the number of runs the offense produces. Does that mean rookie manager Aaron Boone should just pick names out of a hat, Joe Maddon style, and run with it? Of course not. To date, Boone has run out a sensible lineup that has already shown its potency. Yet, if I may, I want to nitpick how he’s ordered the middle of the lineup thus far (Derek, you’re really about to step in it. Are you sure you want to keep going?). Boone has batted Aaron Judge, Giancarlo Stanton, Didi Gregorius, and Gary Sanchez in slots two through five in all games except opening day (vs. a lefty) and Sunday (Sanchez had the day off). It’s evident that the rookie manager’s plan is to split up the three right-handed sluggers with one lefty, whether it’s Gregorius or Greg Bird upon the latter’s return. It’s not some egregious mistake that Boone should be vilified for, because after all, Gregorius is a pretty good hitter in his own right. Yet, it’s not the optimal two through five (Oh boy). On Saturday, Sanchez was left in the batters’ box twice as Gregorius failed to deliver with runners in scoring position and two outs. In the first inning, Gregorius grounded out following a two-out double by Stanton. The Yankees were down 1-0 at the time. Later, in the eighth with the game tied at 3, Gregorius came to the plate with Stanton on first and two outs. He popped out on the first pitch he saw. In both of those instances, Sanchez should have been the hitter. Instead, he was left watching. Obviously, there’s no guarantee that Sanchez would have come through in those spots, but there’s no question he’s a superior hitter to Gregorius. And of course, Didi is going to come through in those situations at times this year (hey, dumb writer of this post, look what Didi did yesterday!). It just so happens that he didn’t on Saturday, which made the lineup order issue stand out. None of this should be construed as a knock on Didi! He’s developed into a very good hitter himself, but he’s not on the same level as Sanchez. I also think that batting Gregorius behind Stanton is going to cost Stanton a lot of pitches to hit. Sunday’s game is a great example of this even though Sanchez wasn’t in the lineup. Toronto’s pitchers walked Stanton three times and passed the baton to Gregorius. 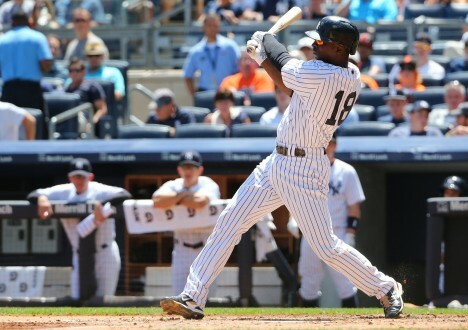 On days that Sanchez is starting, that can still happen with Gregorius hitting cleanup. Think about it this way: with Judge, Stanton, and Sanchez all in a row, it’s next to impossible to pitch around any of them. Do that to Judge or Stanton, and you have Sanchez looming. The only way you can really pitch around Sanchez is if you manage to retire Judge and/or Stanton before him, which is no easy task. The Book says that the difference between a standard lineup and an optimal lineup can be up to 15 runs in a season. Frankly, the Yankees lineup is already pretty close to optimal per The Book‘s standards for many reasons, particularly because Judge hits second. So, the difference between Sanchez and Gregorius flipping lineup slots is a nowhere near that 15 run differential. At most, it might be a handful of runs over the season, which falls short of equating to an extra win. Nonetheless, it’s frustrating to see Sanchez lose opportunities with men on base. Given what we know about the full season implications of a batting order, perhaps I’m making too much of where Sanchez and Gregorius fit in the lineup (yes, you are you dunce). I’m well aware that this offense is going to be near the top of the league, if not at the top, in runs scored regardless of where Boone stacks the bats. Still, I want more. I want to see opposing pitchers have to face Judge, Stanton, and Sanchez in order. There’s no need to give them a “break”, even though this “break” involves a very good hitter. For the time being, it appears that Boone is steadfast with his current lineup construction. It shouldn’t be too harmful, but there will still be room for improvement as long as he stays the course.